THOR is the brain-child of CTruk’s Military and Security team, who between them have amassed approximately 200 years of military experience, skills and knowledge. Realizing that new designs must be right the first time, the company has established a Military Design Advisory Panel (MDAP), which acts as an advisory body, steering design to ensure that vessels are fit for task. The result of all this expertise, not to mention CTruk’s proven offshore support vessel designs, is THOR, a composite, 11m proof-of-concept demonstrator vessel, designed to fulfill a number of roles, including force protection of the amphibious sea lanes, casualty extraction from a beach, carrying and deploying a pre-landing force, riverine patrol, protection of harbors and offshore installations, unmanned surface vessel operations (for protection and mine countermeasures) and disaster relief. Fitted with a remote weapon station and other crew served weapons, THOR is designed to be rapidly deployable via a number of assets, both existing and future (including C17/A400M + CTruk 50T mother ship). THOR is built from modern, advanced composite materials to give a strong and robust structure, which reduces overall vessel weight and saves time spent on operational and maintenance routines, as well as offering significant cost savings in through life maintenance. Reduction in weight translates directly into greater payload, range and speed. 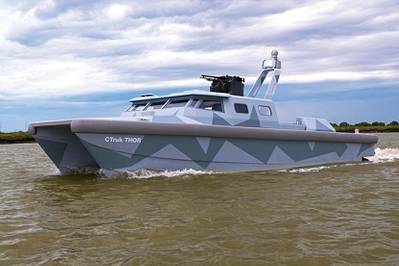 THOR incorporates a range of high-tech equipment, provided through the CTruk Collaborative Amphibious Project (CAP), a consortium of key subsystems manufacturers that have joined forces to deliver an innovative vessel design with high-tech options (details in the notes of this release). Core to THOR’s capability is the systems integration work undertaken by SCISYS . Andy White, CTruk Chairman, commented, “We have designed THOR to meet the changing needs of the global market for defense and security equipment. Global defense budgets are being squeezed like never before and emerging nations most often cite affordability as the major obstacle in their maritime procurement programs. Many navies have lost, or are losing, the ability to deploy appropriate and proportionate capability to respond to a myriad of low-level threats, with the result that billion dollar ships are routinely being used for ten dollar tasks. •Barrus – providing twin Yanmar 8LV-370, 370hp Marine Diesel Inboard Engines and engineering support. Additional 24v alternators to power the control system of the Rolls-Royce Jet Drives and modified water pump mounting position to provide improved accessibility. •CA Clase – providing KVH GyroTrac compass. A digital magnetic compass stabilized by a three-axis gyro sensor which provides drift free precision. •Enterprise Control Systems – providing high quality, encrypted, bidirectional, full motion video & IP data links. •FLIR Systems – providing TALON 25x marinized compact surveillance system for long-range target identification and tracking. •Forsberg Services – providing CPUPak integrated navigation system for precise navigation, sensors, targeting and weapon systems - in conjunction with NovAtel . •Kelvin Hughes – providing SharpEye SCV (small craft variant) solid state radar. •NovAtel – providing GAJT GPS Anti-Jam Technology - in conjunction with Forsberg Services. •Rolls-Royce – providing Rolls-Royce Kamewa waterjet propulsion. •Saab – providing Trackfire 50Cal Remote Weapon Station. •SCISYS – providing MACSYS – Crew Integration System. MACSYS brings together all electronic devices and systems, both on-board and off-board with an ‘open architecture’ computer network and central information management system. MACSYS has built-in resilience from redundancy and reversionary (back-up) modes, providing high reliability. •Scot Seats -Internal crew and troop shock mitigated seating. •Talking Headsets – providing professional communications solutions for boat crew including head, face and ear protective equipment. •TenCate Advanced Armour – providing advanced lightweight composite armour systems. •Trend Marine Products Ltd – providing bullet resistant glazing. •Vision4ce – providing ruggedized PCs client and servers.